Nervousness in dogs can happen for a number of reasons. If you have recently adopted a dog, there may have been situations in their previous household that caused them to develop nervous habits. If you have a nervous puppy, however, it could simply be part of their temperament. Regardless of the reasons for their nervous behavior, K9 and You in Houston can help you with dog obedience training so that your dog can begin to feel more comfortable and safe. Call today and speak with a dog trainer and learn how we can help. While most dogs enjoy walks, shy dogs might not be as excited to go for a walk. There will be sounds, smells, and sights that can be triggers for their fear. 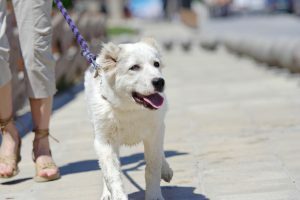 In addition to these factors are the possible encounters with other dogs that are also out for walks with their owners. One way that you can help your nervous dog is to start with short walks. A short walk is a good way to begin helping them learn to associate positive feelings with this experience. Make sure to picture the walk in your mind so that you aren’t walking them near a busy street, or a street where a lot of people may be walking their dogs. Minimizing the number of triggers will help them to more quickly form a positive reaction to the words leash or walk. You will be pleased to see them begin to develop an eagerness for walks. While you may not notice other dogs in peoples’ yards, your nervous dog certainly will notice each and every one. Even if they don’t rush the fence as you walk past, their bark or growl can definitely cause a nervous reaction for your furry friend. A basic rule to follow is the three-second rule. If you encounter others who are out walking their dogs and you can’t avoid an interaction, make sure to limit their sniffing to three seconds and then continue your walk. Just like people don’t like everyone they meet, dogs also do not like every dog they meet. 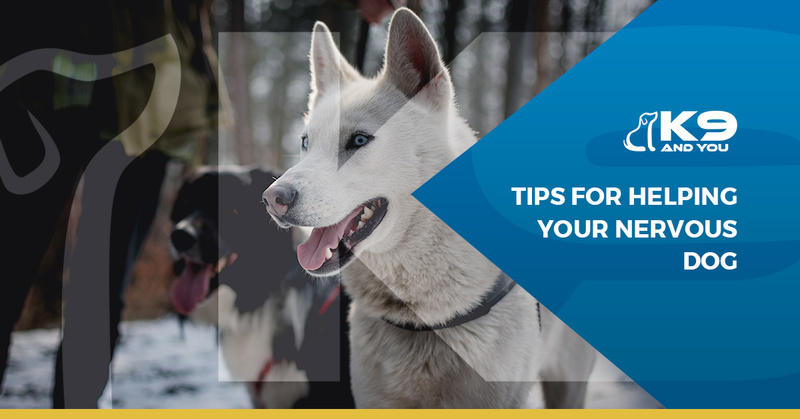 If possible, try to avoid situations with other dogs until you have reached a point where your pup feels more comfortable and confident around other animals. A good way to help them develop this confidence is by having a friend bring their dog to your place for short play dates. This allows your dog the time they need to ease into interactions with another animal at their own pace and on their own turf. Many times, other people don’t stop to think about a situation before diving right in. You may encounter people who try to pet your dog without asking for permission first. You might even encounter people who will attempt to pet your dog while in the process of asking. Do not hesitate to stand up for your dog as they cannot speak for themselves. Be nice, of course, but be firm in the way that you speak. For your safety, your dog’s safety, and the safety of all others involved, firmly communicating that they should not pet your dog is of the highest importance. This is especially important if you are talking to someone with children nearby, as kids don’t necessarily know the right way to approach dogs. Nervous dogs can’t tell people not to pet them, so they communicate through biting. To avoid this situation, and to help your dog develop confidence, make sure to help them with your daily routines so that their nervous reactions will slowly begin to subside. One of the hardest aspects of puppy or dog training is maintaining your patience. There will be times that it seems like your dog is just flying through training and doing so well that you can hardly believe it. Other times may feel as though you are both back at square one. These times can feel especially defeating, so it is important to remember to keep your eye on the goal. In the long run, you know that your dog will learn the things you have been working so hard to teach, and you will both have a much stronger bond as a result. In the meantime, take a deep breath, and continue to speak kindly and give them the patience they need. Training your dog can be challenging. K9 and You in Houston want to help you develop a strong bond with your furry friend through training. We offer training for puppies, adults, and and seniors. Whether you need to work on leash aggression, nervous behaviors, or socialization, we have dog training classes to help. If you have other training questions, we would be happy to help. Call today and speak with a dog trainer about your needs.